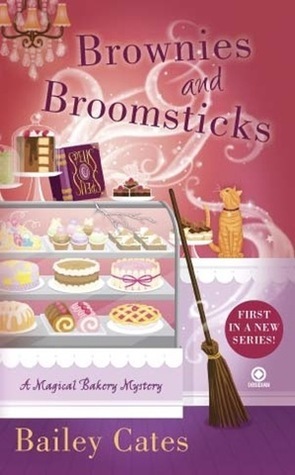 While working at the Honeybee Bakery - named after Lucy's cat - Katie notices that her aunt is adding mysterious herbs to her recipes. Turns out these herbal enhancements aren't just tasty - Aunt Lucy is a witch and her recipes are actually spells! When a curmudgeonly customer is murdered outside the Honeybee Bakery, Uncle Ben becomes the prime suspect. With the help of handsome journalist Steve Dawes, charming firefighter Declan McCarthy, and a few spells, Katie an Aunt Lucy stir up some toil and trouble to clear Ben's name and find the real killer. We've started a new program at our library called "Bookish Diner". Each programming session we pick out a book or an author or a genre or some such thing that is food oriented. Sometimes the recipes are included in the text, and sometimes we use recipes that remind us of the text, but either way we make delicious dishes, book talk books, and share the love of reading (and eating) with our patrons. This month we chose culinary mysteries. Because I'm apparently a programming procrastinator, I didn't read my selected book until the twelfth hour. I powered through the weekend before the program and prepped my dishes. And somehow I ended up with the most ridiculous book ever. Katie Lightfoot recently ended a long relationship and is looking for a new start in life. It just so happens that her Aunt Lucy and Uncle Ben in Savannah are opening a bakery, and Katie just happens to be a baker. So Katie packs her belongings and heads to Georgia. During her first day of work, a tragedy occurs just outside of the bakery. This horrible, socialite woman who likes to yell at people and throw around power ends up dead, and the prime suspect is none other Uncle Ben. Determined to prove her Uncle's innocence, Katie begins to inappropriately insert herself into the investigation. I mean, like, dangerously. And there's a love triangle. And Aunt Lucy reveals a family secret. And Katie is a witch. It wanted to be Practical Magic, but it wasn't. Despite a ridiculous plot line, one-dimensional characters, and a "familiar" dog, I have the overwhelming desire to continue reading the series. Perhaps it's the catchy book titles, tasty recipes, or southern charm, but I got hooked despite myself. This isn't mind blowing literature, but it's fun, and the ridiculousness makes it just a little more fun. Plus, the book you can make Katie Lightfoot's chocolate peanut butter brownies and cheddar sage scones. They were super tasty and easy to make.